There are typically two or three games every year that establish themselves as Video Game of the Year material, but deciding which game should take home that award in 2018 was fortunately a tough decision considering how many impressive video games released this year. From competitive online experiences to single-player games that kept players busy for days, our first year of ComicBook.com’s games categories in the Golden Issue Awards was filled with nominations for all sorts of games. Our Video Game of the Year award nominees featured the most memorable games of 2018, but only one of the titles could receive the award. Marvel’s Spider-Man, developed by Insomniac Games and published by Sony Interactive Entertainment! Doubling as one of the most-anticipated games of the year and also the biggest superhero game of 2018, Marvel’s Spider-Man earned its spot as ComicBook.com’s Video Game of the Year by giving players a thoroughly enjoyable single-player campaign wrapped up in the web of one of Marvel’s biggest heroes. The game was also only released for the PlayStation 4, which meant it wasn’t available on most of the major gaming platforms, but it still captured the attention of Spider-Man fans and those who wanted to see fan-favorite heroes and villains portrayed in a totally original story. Marvel’s Spider-Man was what people refer to as a “console buyer,” a game so exciting and worth playing that it drives people to invest in a new console just to experience it. Iconic characters like Mary Jane, Rhino, Doctor Octopus, the Osborns, and more from Marvel’s universe filled the game to make sure Spider-Man had a run-in with nearly every character the hero’s fans would’ve wanted to see. 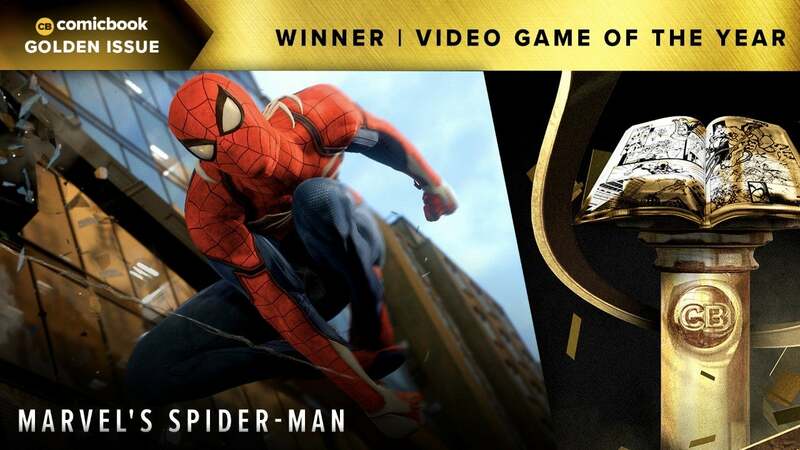 Though Marvel’s Spider-Man won the Video Game of the Year award in ComicBook.com’s Golden Issue Awards, it wasn’t a guaranteed win with so many other games dominating headlines and gamers’ attention in 2018. The full list of nominees can be found below, but you can share your own vote for the best game of the year in 2018 with us through the comments or through social media.